California Senator Ralph Dills sponsored Military Code 999.99, inspired by John K. Lopez, Chairman of the Association for Service Disabled Veterans (ASDV). This was the first legislation passed that included disabled veteran participation on state contracts and the beginning of the Disabled Veteran Business Enterprise (DVBE) program. California was the first state to have a goal program to include disabled veterans on state contracting. With the passage of Military Code 999.99, Mr. Lopez saw the need to inform DVBEs of contracting opportunities and DVBE information. In 1990, Pam Aberg met John Lopez and founded Challenge News at his request. As the state regulations for contracting were implemented DVBEs benefited from having multiple certifications. Challenge News outreach encompasses disadvantaged businesses including, but not limited to: DBE, DVBE, MBE, SBE, SDVOB and WBE. As the program grew, so did Challenge News. Challenge News went from being a bi-weekly publication to two daily publications (Monday through Friday), with the addition of the California Daily Bid Advisor. 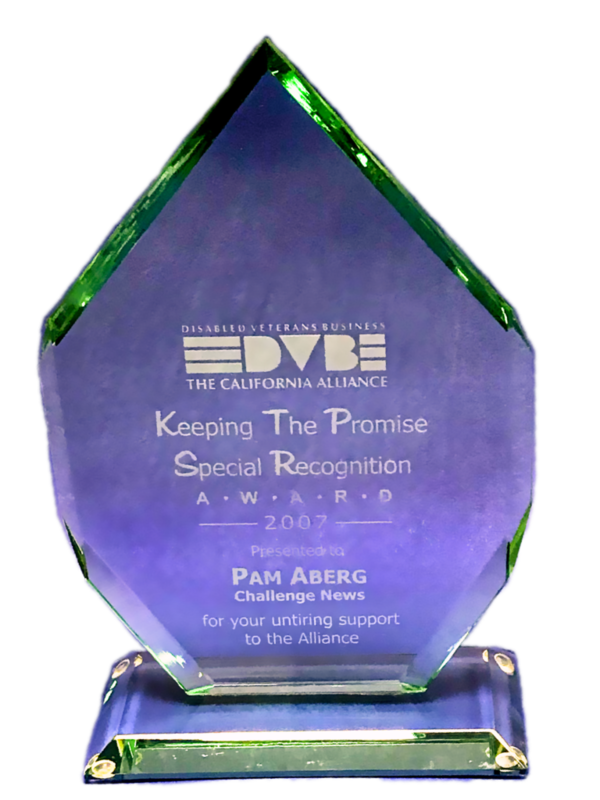 Pam Aberg was a recipient of the “Keeping the Promise” Award.